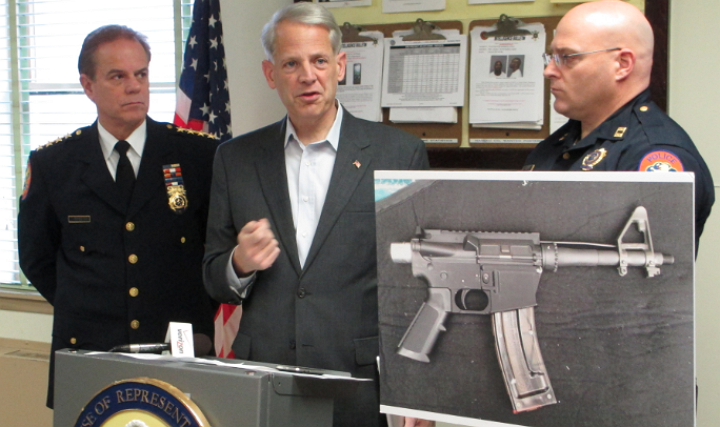 New York Congressman Steve Israel and a photo of an AR-15 which includes 3D printed parts. Gun rights groups from Defense Distributed to the NRA to Come and Take It Texas will not be pleased with the latest piece of proposed legislation from Congressman Steve Israel. Israel, a representative from New York state, first called for legislation to ban 3D printed guns. Israel’s bill has gotten little traction at this point, but he says he’s not about to give up the fight. In fact, Israel says he’ll be reintroducing legislation aimed at banning 3D printed, or for that matter, all fully-plastic firearms. Called the Undetectable Firearms Modernization Act, Israel’s first failed attempt would have forbidden possessing or manufacturing any type of firearm capable of sneaking under the notice of any standard metal detector. Israel says he originally wanted to create penalties for anyone who chooses to build a weapon or weapon component using a 3D printer without the proper permitting and licensing. Though he now says he won’t be targeting anyone who uses a 3D printer specifically, it’s fairly clear his push for this legislation arose from the welter of news stories surrounding firearms such as the Liberator by gun access group Defense Distributed. Cody Wilson, the founder of Defense Distributed, has made no secret of his intention to do his best to thwart any such legislation via technology and free information. While it’s not currently feasible to produce a reasonably safe handgun which uses no metallic components, an entirely 3D printed gun may some day be legally produced with non-metallic materials as advancement in such materials is moving forward at a furious pace. In fact Wilson is currently trying to get his hands on a Mark Forged Mark One 3D Printer, which is capable of printing with a mixture of thermoplastic and fibers, such as Kevlar, carbon fiber, and fiberglass. Mark Forged refused to sell him their printer, but Wilson has publicly sought an alternative route, offering a large sum of money to anyone willing to get him one of these advanced machines. The Undetectable Firearms Act was renewed last year, but it makes no specific mention of 3D printing. With that said, Israel says his new bill is aimed at making sure current iterations of 3D printed guns can’t be legally produced without the proper licensing and marketing. The law still lags behind recent innovations in DIY gunsmithing as the lower receiver of an AR-15 semi-automatic rifle can be printed or milled and the rest of the weapon is legally available. In fact, Defense Distributed sells a simple CNC mill capable of creating those lower receivers from aluminum. Michael Weinberg, an analyst who works as general counsel at 3D printing service bureau Shapeways, told WIRED his company was not in favor of any bill which would make 3D printing a gun illegal. Weinberg is the author of “It Will Be Awesome If They Don’t Screw it Up: 3D Printing, Intellectual Property, and the Fight Over the Next Great Disruptive Technology and What’s the Deal with Copyright and 3D Printing?” Weinberg regularly writes about and speaks on the policy implications of emerging technologies in the press and at events. Where do you stand on the issue of 3D printed firearms? Should legislature be put in place blocking you or me from printing guns from the privacy of our own homes? Let us know in the Bill to Ban 3D Printed Firearms forum thread on 3DPB.com.